The Surround Master v2 combines true circular surround sound with real-time remastering to produce a completely accurate sound experience. Every sound recorded on a track is reproduced in exactly the same location where it was recorded, giving you the sense of actually being there. Here’s how we do it: Real-time remastering – The Surround Master v2 listens to each track as it plays and extracts all of the recorded sounds with our patented technology before sending the signals to the speakers. Nothing is added or removed, we just do the industry’s most perfect job of reproducing what’s on the track. 360-degree surround sound combined with total reproduction of every track. Clear separation – Accurate separation of left and right, and front and back sound means that every sound appears to come from a specific point in space, rather than being indistinct or “smeared” between speakers. Fully stereo compatible – Whether you have 2, 4 or 5 speakers, the Surround Master v2 creates a circular surround sound for every record, tape, CD, MP3 file, video, streamed file, or any other format you use. It actually listens to the recording in the same way humans listen to the environment – of course if there are no surround cues within the original tracks, there will not be any surround sound produced by the Surround Master v2 as it neither adds or subtracts anything from the recording. However, the majority of original stereo recordings have at least some surround sound information in them that has never been successfully and accurately reproduced by existing systems. 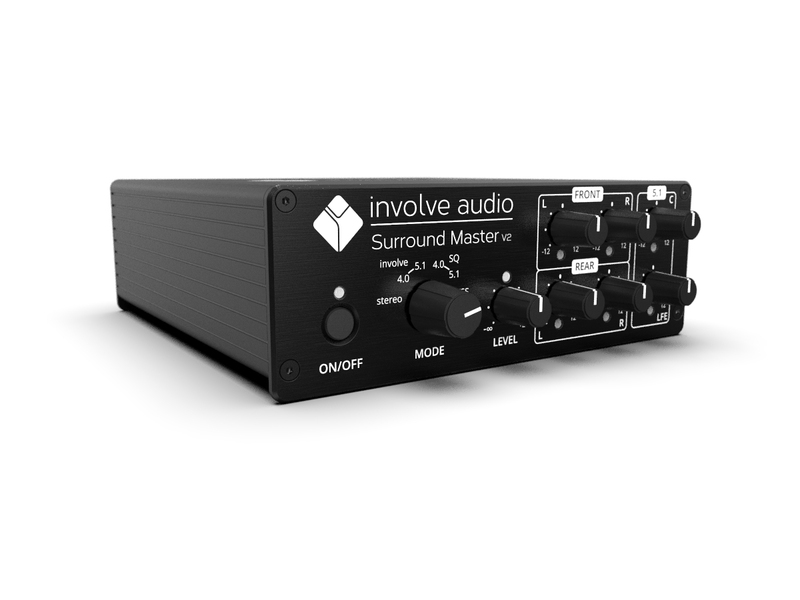 In most cases your music or DVDs will sound much better, as the Surround Master v2 reveals everything in the recording, providing more clarity and making you feel more involved in the music. It allows you to experience things from your favorite audio that you may not have realized were even there. When only two speakers are available, the system has the option to provide a “virtual surround” from the two speakers. This broadens the sound stage for almost everyone listening to the system and has the ability to provide a full surround sound effect. As it is a virtual surround experience, it differs from listener to listener. In our tests we find an 80% success rate of people who perceive the audio to be coming from elsewhere but the speakers. Our Two Speaker Surround system (TSS) doesn’t rely on specifically shaped listening rooms – it doesn’t bounce sound off the walls.